Donna Daufenbach tried her hand on a road-course simulator during the Driver Education tech session at CS Motorsports early in the year. 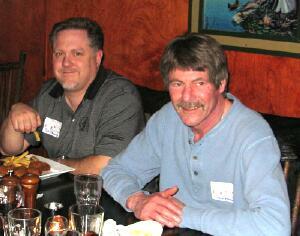 Todd Flemming, left, and Greg Kovacs, enjoyed the fish fry casual dinner in April. Brothers Tom and Rick Golner always set a brisk pace at the region's autocross events. Here, the Golner car is on course during the July event at Miller Park. June was the time for the region's annual Spring Tour, led by brothers Jay and Lee Heppe. 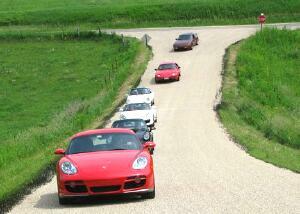 Porsches took over the roads in central Wisconsin, adding to the spectacular landscape. Carrera Chili judge Paul Stewart, right, marks his comments while Mary Richter, left, and Tom "Muck" Mucklin sample some of the batches. 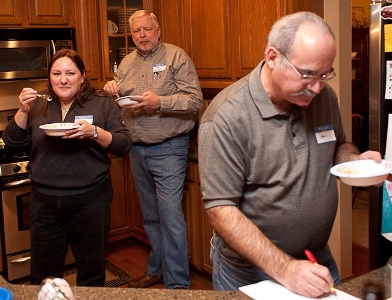 The 2011 Carrera Chili event was hosted by Geoff and Stacey Wilde of Racine. 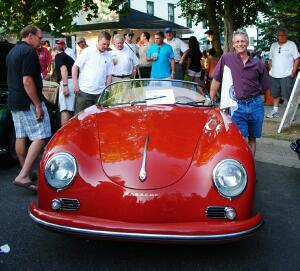 Region member Dave Zimmer, right rear, won a national award for his restoration of this 356 in the 2011 Road&Track concours d'elegance in August 2011 at Elkhart Lake, Wis. Region members flocked to the monthly Cars & Coffee in Lake Mills. 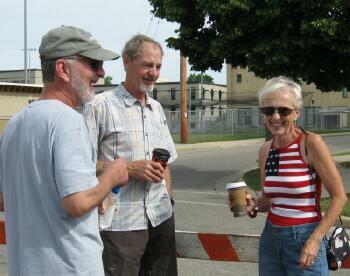 In July, the roving photographer spotted Jim Van Orsdol (center) and his wife, Charlie (right). 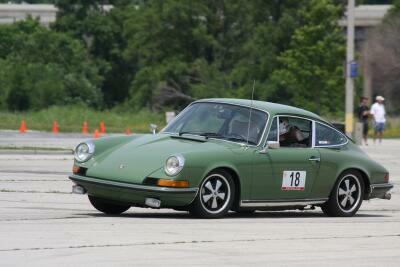 Porsches were the featured marque at the Milwaukee Masterpiece in August on Milwaukee's lakefront. 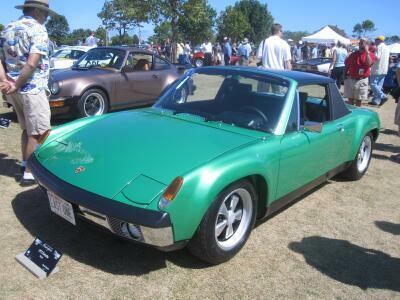 Region member David Hatch showed his pristine 914-6. David has won several national concours awards with this car. 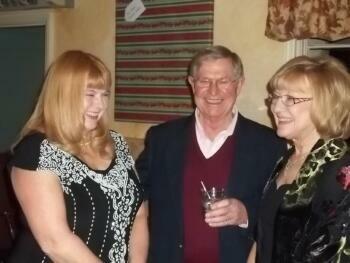 Region members capped off the year at the holiday party on Dec. 3. 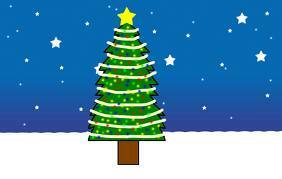 Thanks to all members who took part in some or many of the events that the region organized this year. We had a great year, with opportunities to drive our cars, learn some maintenance tips and enjoy each other's company. The 2012 board will be seated soon and, along with committee chairs, will begin to plan the events for 2012. If you have an idea or would like to lend a hand for any events or activities, please let us know. Region leaders are listed on the Contacts tab of this website. Jan. 5 - Board meeting. Wisconsin Club Country Club, N. 60th and W. Good Hope on Milwaukee's northwest side. Members are always welcome to pull up a chair and join in the conversation. 6:30 p.m. start time. No RSVP required. Feb. 18 - Turbo Spaghetti. Every year in the middle of winter, the region gets together for a social night. One year it's Carrera Chili. The next year it's time for Turbo Spaghetti. In 2012, spaghetti and homemade sauces will be in the spotlight. Make a batch of your family's famous spaghetti sauce. Bring it to this event for some friendly competition. Not a cook but like to sample? This is the place to be in mid February. The region will provide the pasta, salad, beverages and dessert. Our hosts for the evening are Jerry and Peggy David of Franklin. More details will be published on this website in the near future. June 16 - Waterfalls tour in the Upper Peninsula. The Fox Valley region extends a welcome to Milwaukee Region members for this follow the leader type of driving tour. If you're looking for a fun weekend of driving your Porsche in the unspoiled, wooded environment of the UP and enjoying the company of other enthusiasts, mark the calendar. Many participants over night on Friday and Saturday for this event. A host hotel will be announced. June 23 - Ladies driving tour. The Fox Valley region extends a welcome to women of the Milwaukee Region for this one-day tour. Drive your Porsche or get the keys from you know who for the Porsche that's in your garage. The Fox Valley team will establish a rendezvous point where Milwaukee women can connect to the tour. Plans are to head to the New Glarus region, southwest of the Milwaukee area. Stops along the way for food and shopping are guaranteed. July 8 - 13 - Porsche Parade in Salt Lake City. The annual gathering of members of Porsche Club of America. Attend Parade for total immersion in all things Porsche and PCA. 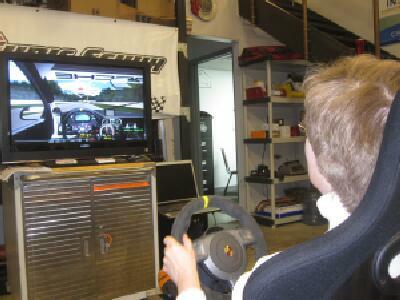 Aug. 10 - Milwaukee Region one-day driver education at Road America. More details will be published about this event which gives drivers the opportunity to learn and apply safe driving techniques on the four-mile, 14-turn world renowned Road America road course. While the new year hasn’t started, planning has begun for next year’s DE events. Our Road America experience is scheduled for Aug. 10. This is a new date for our region. With any luck we’ll have much warmer weather than the kind we had in early May. More information will be provided after the first, but should you have any questions, please reach out to Terry Royals, Bill Wright or Al Wagner, your DE Coordinators for 2012. 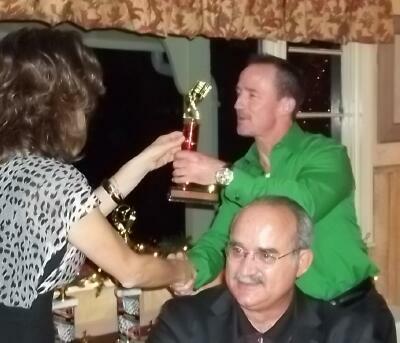 The top drivers in the region's autocross series were announced and celebrated at the Holiday Party on Dec. 3. First-place honors went to both Dean Fabritz and Jerry David, who tied for the top award. George Kowalski captured second place. Third-place went to Mike Radle and fourth was Mark Thomsen. Radle and Thomsen were not present. chair and served as the spokesperson at the holiday party. 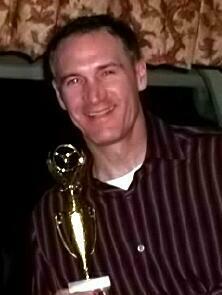 Jerry David and the trophy for his first-place finish in the 2011 autocross series. Thanks to all who participated in the region's AX series or who helped with the events as corner workers, starters, scorers. 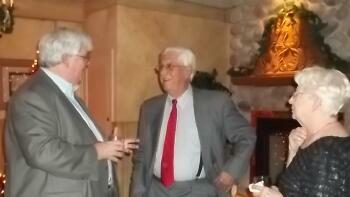 And finally, a big thanks to Bruce Tammi, who has chaired this event for the past several years. Bruce is stepping down. We appreciate all of the time he has given to make these events safe and fun. We also appreciate his and Maria's willingness to store the cone-filled trailer on their property these past years. Thanks to George Kowalski and Jerry David who will co-chair Autocross in 2012 for the region. Gregg Eisenhardt rejoined the region in July of this year. He previously was a member in the 1970s and in fact was region president in 1973. He’s driving an '08 Carrera S that has 15k miles on it. It’s his third Porsche. “My first was a '67 912 that I owned in the late '60s and the second was a 914 that I owned and autocrossed in the early '70s,” Gregg reports. He previously owned Good Electric, a contracting firm in Milwaukee, but sold it last year to Lemberg Electric where he works part time, being semi-retired. He lives in Pewaukee and has already participated in a number of region events including the fall driving tour. Gregg finishes his story with this: “One of the biggest thrills of my life was driving a 997 Turbo on the Autobahn at 177 mph two years ago.” We’re envious Gregg. Welcome back. The following joined our region in the month of November. James and Kathy Hoffman, of Mequon, who drive a 1999 996, transferred to our region from the Arizona Region. Thanks to all members who renew their membership on a time. PCA does not send multiple reminders. With no warning, your membership will lapse if you don't take action. Did you know that for no extra cost you can list a family or affiliate member in your membership? Log on to the PCA.org website to update your membership record. 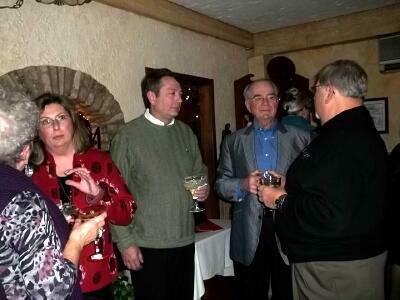 Forty-eight members and their guests gathered at the Copper Dock in Hubertus, Wis., for the region's 2011 holiday party. Organized by Sharon Stewart of the Social Committee, attendees enjoyed the opportunity to relax in a comfortable setting. Seated at tables of six, eight or 10, the Copper Dock staff served a tasty dinner that included all-you-can-eat prime rib. Other menu options were also available. 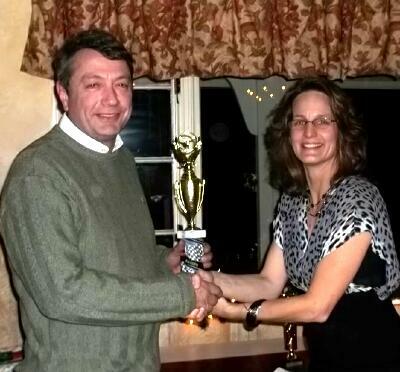 The evening included the presentation of the 2011 autocross awards. Donna Daufenbach added a festive touch to the night by bringing a number of door prizes. Renee Messing, region treasurer and nominating committee chair, announced that the election of officers was open through Dec. 7. Members were encouraged to cast their ballot to elect officers to serve on the 2012-2013 board. 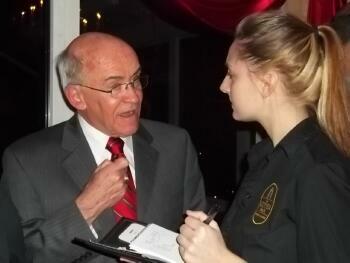 Members had a chance to make new acquaintances. The wait staff was attentive and ensured no one was thirsty. Porsche's engineering is reviewed in this Wall Street Journal article. Click here. ATLANTA - November 22, 2011 - Porsche is introducing two new cabriolet versions of the recently unveiled seventh-generation 911 Carrera. These new models, the 911 Carrera Cabriolet and 911 Carrera S Cabriolet, will go on sale in the United States in the spring of 2012. Like the coupe, the 2012 911 Carrera cabriolet features innovative aluminum-steel construction with the addition of an all-new convertible top design, which preserves the typically sleek 911 coupe roof line. Intelligent lightweight design that includes extensive use of aluminum, magnesium and advanced high strength steel ensures lower vehicle mass and lower fuel consumption awhile offering improved driving dynamics and additional comfort. 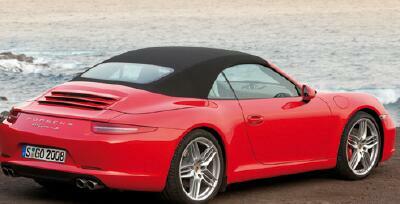 As with the 911 coupe models, the new Porsche open-top models are significantly lighter than their predecessors. The new 911 Carrera cabriolet can accelerate from 0-60 in as little as 4.4 seconds and achieve a top-track-speed of 177 mph, while the 911 Carrera S cabriolet can reach 60 mph in as little as 4.1 seconds and has a top-track-speed of 187 mph. Each of the two new cabriolets uses the same engine as their coupe equivalents. The rear of the 911 Carrera houses a 3.4 liter boxer six-cylinder engine with direct fuel injection (DFI) generating 350 horsepower (hp), driving the rear wheels through a standard seven-speed manual transmission or an optional PDK dual-clutch automated manual transmission. The open-top Carrera S comes with a 3.8- liter boxer six-cylinder DFI engine developing 400 hp. The open-top 911s are significantly more efficient than their predecessors; both models consume less than 10 L/100 km on the New European Driving Cycle (NEDC). U.S. Environmental Protection Agency (EPA) figures will be available closer to the on-sale date. With the longer wheelbase, wider front track and host of new features just introduced on the 911 Carrera and Carrera S models, the new cabriolet variants offer sportier driving characteristics, greater precision and agility and increased efficiency. On sale in the spring of 2012, the 911 Carrera Cabriolet MSRP is $93,700, while the 911 Carrera S Cabriolet MSRP begins at $108,000. ATLANTA - November 21, 2011 - When the new Porsche Cars North America (PCNA) headquarters opens in late 2013, it will send a clear visual message that whether man-made structure or automobile, the presence of Porsche DNA means uncompromising quality, performance and style. To ensure that every square inch of the brand new facility is infused with these Porsche brand and product values, Porsche has selected HOK, a leading global architectural firm, as its design partner. One Porsche Drive, the future address of PCNA, will be home for up to 400 U.S. Porsche employees, and is also designed as a must-see destination for Porsche owners, dealers, enthusiasts and visitors from around the world. It is a unique concept within the automotive industry, combining modern offices, technical service and training and the world-class Porsche Customer Experience Center – one of only four such facilities around the globe. The “Aerotropolis Atlanta” development site, near the brand new International Terminal at Hartsfield-Jackson Atlanta International Airport, connects Porsche with millions of consumers. By 2015, airport data forecasts over 100 million visitors annually, and one of the first impressions for every traveler will be a bird’s-eye view of the 26.44-acre Porsche facility. While the exterior structure of the building pays homage to the lines of the iconic Porsche badge, the sights and sounds of Porsche won’t just be thrilling visitors on the outside. An equally important part of the design criteria was to bring the Porsche brand and product experience inside to office and meeting environments, hospitality areas, training facilities, even the parking structure. In a first for any North American automotive headquarters, the One Porsche Drive site design integrates the track with the building, bringing a whole new definition to “rush hour” – namely that of the adrenaline kind. To allow employees and visitors to share that passion, the new headquarters office layout will steer clear of “cubicle culture” and instead offer open, light-filled individual and shared work spaces, ideal for collaboration and creative spark. Discussion and idea exchange between team members is reinforced at every turn, from transparent stairwells to a central “Main Street” atrium and courtyard, where a static display of Porsche automobiles is complemented by close-up views of track action. Like Porsche cars, technology also plays an important role in the facility design, especially in the achievement of sustainability goals. HOK will consider principles of biomimicry, the study of how plants and animals adapt over time to thrive in specific geographies. From landscaping that acts as a natural shade producer in the summer and lets in more sun during the winter to rooftop rainwater collection and filtration, One Porsche Drive will strive for a high level of LEED certification. Porsche expects to dedicate the new U.S. headquarters location with an official ground breaking ceremony in early 2012.